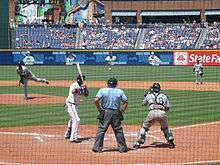 A base on balls (BB), also known as a walk, occurs in baseball when a batter receives four pitches that the umpire calls balls, and is then entitled to reach first base without the possibility of being called out. The base on balls is defined in Section 2.00 of baseball's Official Rules, and further detail is given in 6.08(a). It is considered a faux pas for a professional player to walk to first base; the batter-runner and any advancing runners normally jog on such a play, with Pete Rose earning his nickname "Charlie Hustle" due to him running towards first on a walk. The term "base on balls" distinguishes a walk from the other manners in which a batter can be awarded first base without liability to be put out (e.g., hit by pitch, catcher's interference). Though a base on balls, catcher interference, or a batter hit-by-a-pitched-ball (HPB) all result in the batter (and possibly runners on base) being awarded a base, the term "walk" usually refers only to a base on balls, and not the other methods of reaching base without the bat touching the ball. An important difference is that for a hit batter or catcher's interference, the ball is dead and no one may advance unless forced; the ball is live after a walk (see below for details). A hit by pitch is not counted statistically as a walk, though the effect is mostly the same, with the batter receiving a free pass to first base. One exception is that on a HBP (hit-by-pitch), the ball is dead. On a HBP, any runners attempting to steal on the play must return to their original base unless forced to the next base anyway. When a walk occurs, the ball is still live, any runner not forced to advance may nevertheless attempt to advance at his own risk, which might occur on a steal play, passed ball, or wild pitch. Also, because a ball is live when a base on balls occurs, runners on base forced to advance one base may attempt to advance beyond one base, at their own risk. The batter-runner himself may attempt to advance beyond first base, at his own risk. Rule 6.08 addresses this matter as well. An attempt to advance an additional base beyond the base awarded might occur when ball four is a passed ball or a wild pitch. In 1880, the National League changed the rules so that eight balls instead of nine were required for a walk. In 1884, the National League changed the rules so that six balls were required for a walk. In 1886, the American Association changed the rules so that six balls instead of seven were required for a walk; however, the National League changed the rules so that seven balls were required for a walk instead of six. In 1887, the National League and American Association agreed to abide by some uniform rule changes and decreased the number of balls required for a walk to five. In 1889, the National League and the American Association decreased the number of balls required for a walk to four. Because intentional walks involve throwing a ball, from the pitcher's usual spot on the pitcher's rubber, to a target that is significant distance from the plate and the batter, they involve some mental and physical adjustment, and/or re-adjustment to the subsequent batter. These could subtly affect or interrupt a pitcher's focus, mechanics, and/or rhythm; and, in turn, at least momentarily affect the pitcher's command, leading to an 'unintentional' walk to the next batter. The 'unintentional' walk following an intentional walk is not common, but is also not that rare. A common nickname for the intentional walk is four-finger salute, since most managers call for an intentional walk by holding up four fingers. Outside the professional leagues, such as in high school or college baseball, the manager may simply request to the plate umpire to let the batter go to first instead of having the pitcher waste four outside pitches. ↑ Bob Carter. "Hustle made Rose respected, infamous". ESPN. ↑ Joe Kay (April 13, 2013). "Pete Rose brought hustle, first hit 50 years ago". philly.com. ↑ Office of the Comm'r of Baseball. 2001 Official Rules of Major League Baseball, 6.08(a). Triumph Books. pp. 93 (Rule 6.08(a)). ISBN 1-57243-397-3. ↑ Office of the Comm'r of Baseball (2000). 2001 Official Rules of Major League Baseball. Triumph Books. pp. 93–94 (Rule 6.08(a)–(c)) (describing (a) bases on balls, (b) hit–by–pitched–ball, and (c) interference). ISBN 1-57243-397-3. ↑ In 1887, Major League Baseball counted bases on balls as hits. The result was skyrocketed batting averages, including some near .500, and the experiment was abandoned the following season. Current record books do not count walks in 1887 as hits. ↑ Office of the Comm'r of Baseball (2000). 2001 Official Rules of Major League Baseball. Triumph Books. pp. 93–94 (Rule 6.08). ISBN 1-57243-397-3. ↑ 2001 Official Major League Baseball Fact Book. St. Louis, Missouri: The Sporting News. 2001. pp. 276–280. 0-89204-646-5. ↑ "Marlins' Cabrera spoils intentional walk in win". espn.com. 2006-06-22. Retrieved 2007-06-02. ↑ Holtzman, Jerome (May 2000). Free Pass—Players who were intentionally walked with bases loaded – Brief Article. Baseball Digest. Retrieved on 2009-05-13.